This was, perhaps, the worst trip I've taken photography results-wise. Animal sightings were plentiful, but they were almost invariably far away, with intervening brush and/or bad light. I had much more luck in Grand Teton than Yellowstone, and I didn't have that much there. I did SEE a few interesting things, but basically the only good photos I had were of a 1-2 year old cinnamon black bear eating berries on the Moose-Wilson. I saw a great horned owl across the river at Moose parking area, too far away to get a photo. I saw a great grey owl just before the beaver ponds on Moose-Wilson, but at 7:30, well after dark. 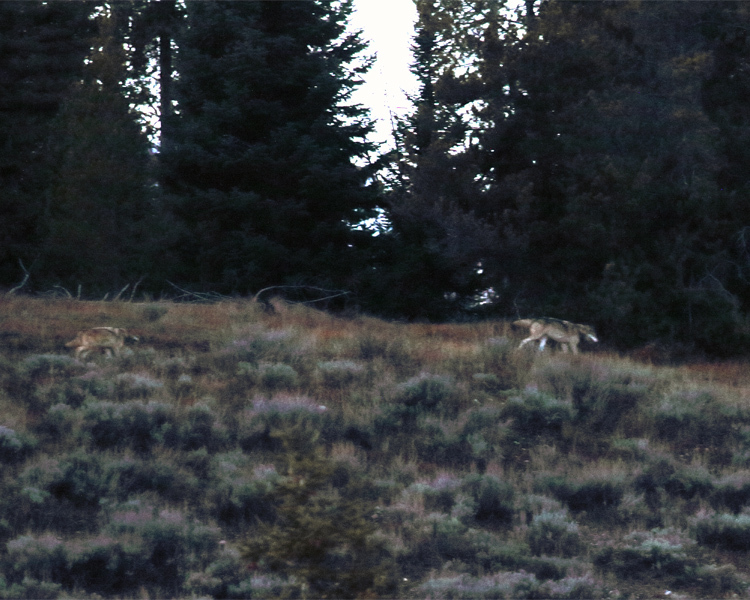 I saw a bull, cow and yearling moose on the hill across from Moose parking area at 7PM, well after dark, saw them run across the road and then saw three wolves come down the hill after them, but again, well after dark. I saw the Rockefeller Parkway grizzly once, and didn't get any good shots of him. I saw a sow and cub in the Pelican Valley, too far away for good photos. I saw my first cross fox up near Sylvan Lake, but it was very early in the morning and the light was bad enough that I got maybe two usable shots of him. I saw two other foxes well before dawn on the Dunraven. I was inevitably at the wrong place at the wrong time when it came to spotting wildlife close enough and in good enough light to photograph. On the positive side, I liked the Toyota 4-Runner I rented and had fun off-roading with it. I also got a great deal on a hotel room in Jackson. And I saved a bunch of money on car insurance by switching to Geico. Your report sounds a little like my most recent fishing trip down your way. I had fun in spite of the wind and hopefully you did too.